It was one of those rare coincidences where the weather decided to work with what I wanted to wear. 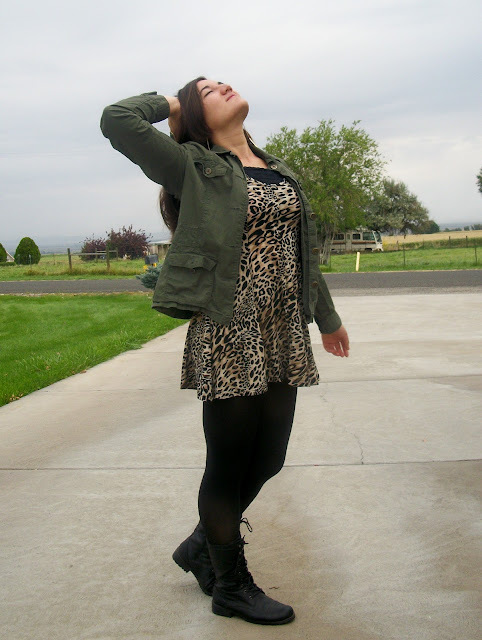 I've been ready for fall for a while now, and when I received this leopard print dress from Sway Chic, I knew immediately I'd want to pair some tights and a military jacket with it. Also, I'm certain these combat boots will be making a lot of appearances once it gets consistently cold. Because what better way to stay functional for all the slick surfaces and still look stylish? This dress is pretty clingy, which made me realize I better stick to my running! Haha, I've been so worn out with school and work that I've neglected going on jogs. My excuse has been that I have dance and volleyball working me out twice a week, but the truth is, I definitely could squeeze in at least one or two more work outs of my own. Ugh, I really don't want to become a Freshman 15! Have you heard of that term before? Its a joke that college freshman usually gain 15 pounds during their first year. I can totally see how that would happen too! If anything, this dress will ensure I avoid that...aha, it definitely fits like a second skin! I like it though.It has a swingy skirt that makes it fun to move in and twirl around. Yesterday was such a long day. I went to school from 11-4, then worked 4-10:30. Ugh, I hate closing hours! But I talked to my manager and he said he'll put in a word and see if he can get me Friday's off, because even he disagrees with the scheduling and how that was done. Anyway, when I got off work I was solely focused on getting into my car and going home. I unlocked my door, tossed my stuff in, and was about to climb in myself when I heard a familiar voice say, "Hey there." I whirled around and did a double take. Patrick was parked right beside me! Haha oh man, I don't even know how I missed his car, but I was really out of it. He got a kick out of my shocked expression. Apparently he'd closed at his job too, and since he works just down the street from where I do, he'd decided to surprise me. And did he ever! Talk about being oblivious. It was like I had blinders on. But yeah, that was a pleasant surprise. I swear we only were talking and catching up for about half an hour, but when we checked the clock it was almost two hours later. Yikes! Thankfully it's the weekend, so it was no problem. 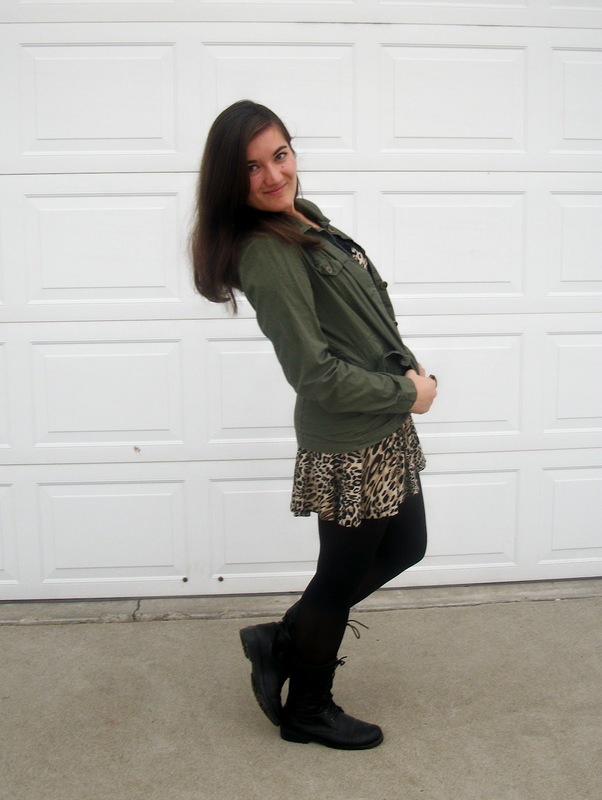 The leopard dress looks great with the army green jacket! And the boots totally pull it all together. Freshman 15 is totally no myth! Especially if your uni has an all you can eat buffet.. Hah. Leopard is my favourite animal print without a doubt. What a nice surprise by Patrick. The more I read about him, the more perfect he sounds!! Aw what a sweet surprise! Ohhh, I want your jacket so much! Wow love this look! I really love the boots, you ROCK this outfit!! Love the leopard! And the jacket adds such a fun touch! Weird, I just clicked to write a comment on this post and I got an email saying you had commented on mine at the exact same time! Great minds :) Anyway, this is such a fun outfit! This dress and jacket were made for each other. I just got an army-type jacket in the mail today and I can't wait to wear it. On an unrelated note, try not to overwork yourself or stress yourself out too much with school! 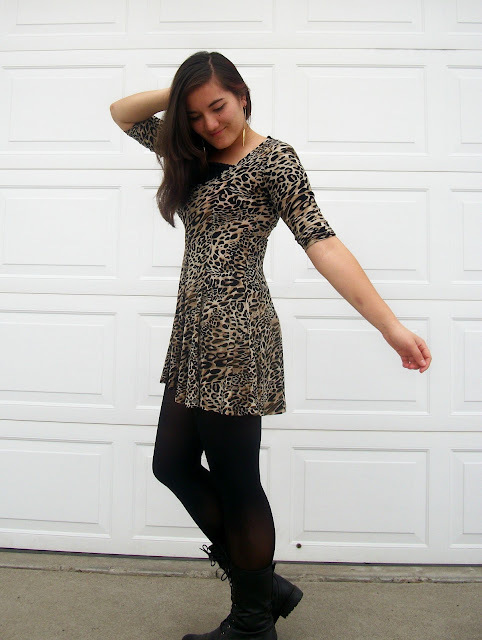 That's one great way to wear a leopard dress! It doesn't have to be glittery or glam, as most people think :). I love how the colors work together! 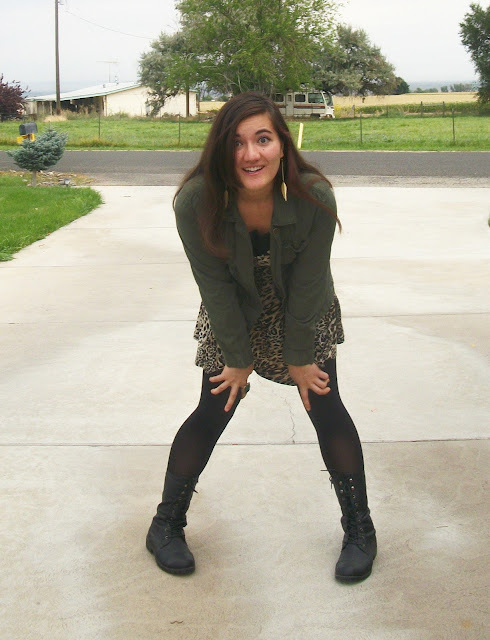 The leopard print with the color of jacket is a nice contrast to the black boots! Hi dear, i think the dress fits great! I never thought of combining animal print and army green before, it looks really chic. love the dress and ou styled it great with the boots and jacket! Those boots are amazing! Love them. The freshman 15 is such a myth, and it won't happen to you. I mean, I've been a healthy eater and daily exerciser, but people around me who weren't didn't ever gain any weight... in fact, they lost some! Unless you're like, stopping by donuts for breakfast every day on your way to class, you're not gonna get chub chubs, girl. haha! But gosh, that dress is SO CUTE. Like so cute. I love this whole outfit and it might be my favorite of yours so far? Yep, maybe! Those boots are functional, too. It's funny because I had a pair of black combat boots like that that I wore out during my freshman year, too! nice prints!!! and the boot~! wow militarya nd leopard! 2 trends in one- well done!! Love the boots too! Love the leopard dress. It looks fabulous on you! That dress is uber cute on you! Aww your boy is so cute! I love it when my Jim does that too! I like the dress and LOvE the jacket! I have been a little obsessed with finding a military jacket! Thanks so much for stopping by...sure, happy to follow each other. Love the storyteliing/lookbook style of this post! Very interesting! I love this whole look. lace up boots , leopard print and military jacket put tpgether equals perfect outfit post! 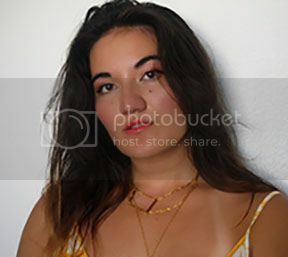 If you have time please check out some of my looks on BestTrendsForever.com!! leopard print is definitely one of my favourite prints and it's always exciting to see how others wear that print. and your dress looks lovely! ps. you can now win some fabulous Sabre sunglasses on our blog! you're gorgoeus! Love that you're not scared to wear a leo dress! Fab! this is definately a fall outfit! it's getting colder here as well...which means it's time again for boots and jackets! Thanks for your comment, hope you had a good weekend! Cool boots ! ^^ Lovely outfit, and that ring looks so precious :) Cute! Thanks for commenting on my blog! Loving yours, you've just gained a follower! Great look! The ring is gorgeous. I know you're not going to be a Freshman 15, don't worry you are active person. im not ready for cold hahah but i love this look! you look bangin in this dress! it is super flattering! 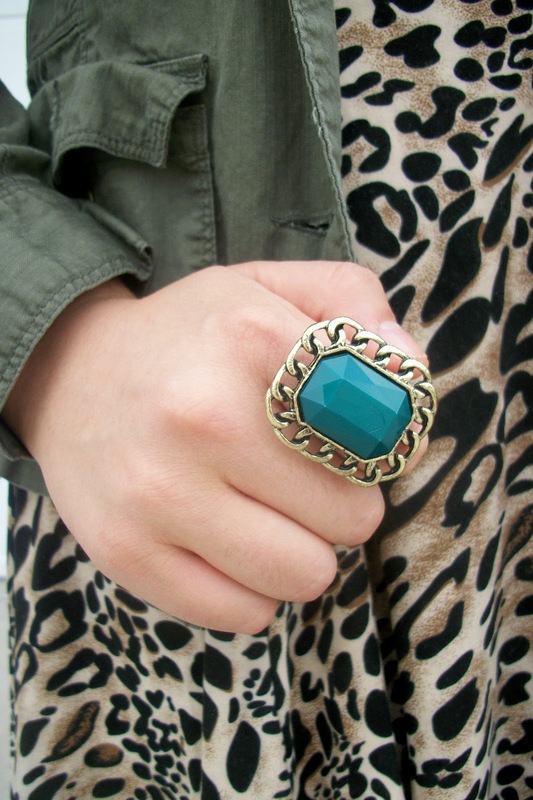 Such a perfect look for kicking around, the hint of leopard gives that little dose of glamour! LOVE the boots + dress! That dress looks so good on you!! so nice! Love your dress! Looks like you have a found a great pair of boots just in time for fall! Anything that is practical AND cute is a double bonus to have in your closet. It's finally starting to cool down a bit over here, I can't wait for fall weather...such a cute outfit! Makes me excited for days of layering and wearing tights. You're so cool! I love your style! I'm now following! Hope you can check out my blog and follow as well! I love this, you look amazing! The jacket is so cute. Can't believe you thrifted it! Fabulous outfit, love the jacket and who doesn't LOVE leopard print! Sway Chic definitely has some great dresses! oh my gosh, boots and military jackets. Fall is finally here! I'm normally not a big fan of leopard but that dress is perfect and looks great on you! Plus I love that you paired it with the military jacket, you look stunning! 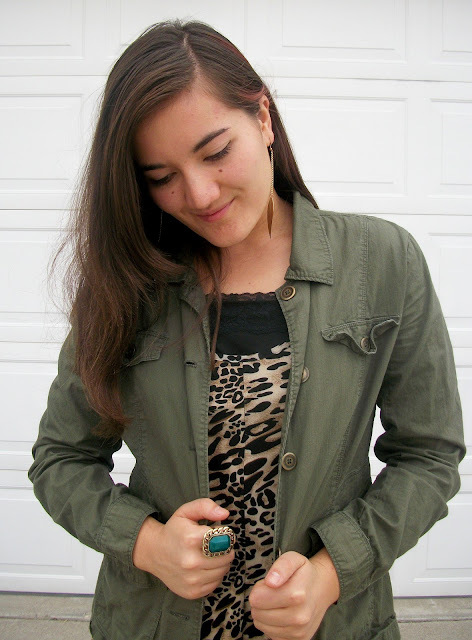 love the leopard and utility jacket combo! really great for fall! haha love your leopard top, and that is a pleasant surprise!! I love the jacket and the boots with that dress! 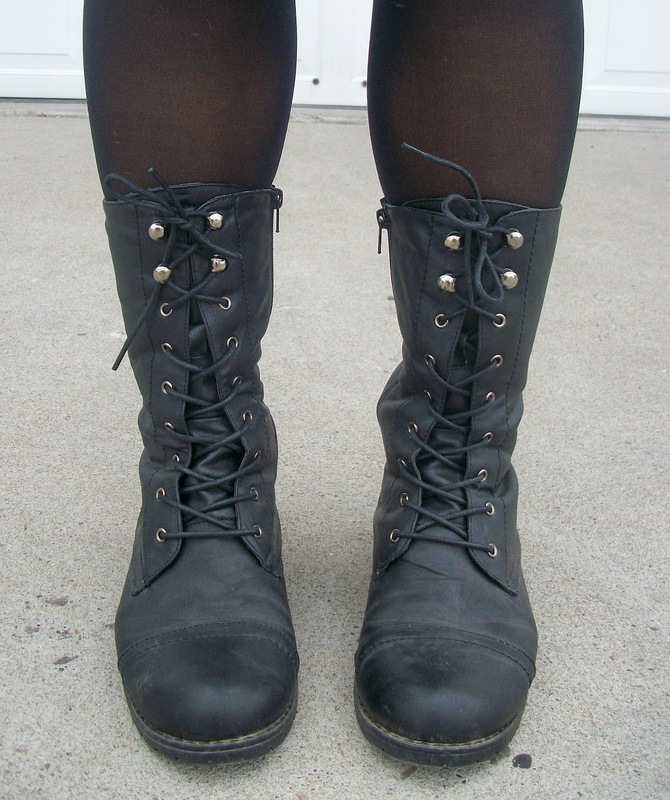 I wear my combat boots about 5 out of 7 days in the winter time, they are preeetttyy beat up looking! Love pairing them with my army green jacket too over a more feminine dress. You look adorable! Love that leopard dress & how highly remixable it can be!! I love the leopard with the olive, such a great combo. Those boots are gorgeous by the way. Don't blame you for wearing them nonstop. thanks for your comment! you have a sweet smile, and I love your accessories! perfect jacket and boots combo. very concrete jungle! Thanks for your visit. PLs joing this giveaway and win 50$ Sheinside giveaway. Love your outfit, that dress in combination with those combat boots is amazing! I really like your ring, it's so unique! You look great, I like the casual outfits like this one. Love the boots! They add the perfect amount of edge to your outfit. Aww that's a cute surprise! Good thing to lighten up a long day. And WOW that ring!! That is some serious ring power right there. BAM!